You have to have big muscles to be strong, right? While big muscles have become very popular and deemed attractive ever since Arnold Schwarzenegger first swung his sword in Conan, the truth is, being strong doesn't always mean being big. I don't know about you, but I can barely do a pull up using both arms, so I most certainly can't swing around with my whole body weight hanging precariously from a couple fingers like Brooke Raboutou. 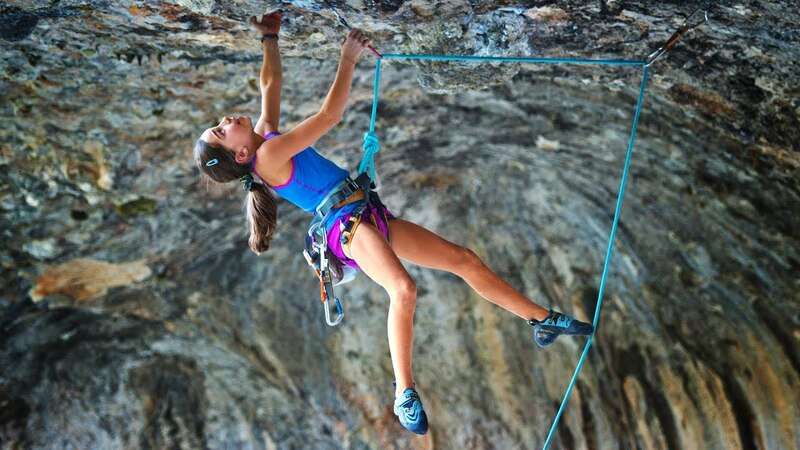 When it comes to sport and rock climbing, as well as most other strength based activities, one of the key factors most people don't take into consideration, is the "strength to weight" ratio. This ratio is the reason you'll NEVER see a 265 pound bodybuilder scaling the face of a cliff, unless it's in a Sylvester Stallone movie. Think about it. Hauling a huge muscular body up against gravity just isn't the most efficient way to go. Sure, an offensive lineman in the NFL needs to weigh in at over 300 lbs to get the job done, but he is only moving a couple feet at a time and it's not even in the vertical direction. Stop for a moment and think about the athletes that compete in these sports and you might realize that a LOT of them are not huge and bulky but rather compact and have just the right amount of muscle to get the job done. Yes, I know, you can probably pick up heavier things than Brooke can, so my title above is a bunch of malarkey, right? Well, when you look at what Brooke can do in a pound for pound comparison, you might be surprised who takes home the bragging rights. Maybe Brooke is a great example of why we should all rethink what it means to be strong. Maybe I am pumping her up just because I have been personally humbled on the rock climbing wall. Either way, we can all admit she is a shining example of what a person can achieve if they put their minds to it.